THE mother of missing Amy Fitzpatrick has announced she will marry Dave Mahon before he stands trial for the murder of her son Dean. 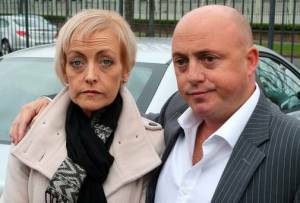 In March this year Mahon, 43, was charged with the murder of Audrey’s 23-year-old son in Dublin in 2013. However, Audrey still claims she loves him and ‘will be proud to be his wife’. She told the Daily Star: “He knows I love the bones of him. He knows I would be lost without him. I would be dead without him. “We will have an awful lot of well-wishers and we will have the other side, but we have to take the good with the bad. “Everybody has their own opinion and they are entitled to it – but they have never walked in our shoes. “Ninety-nine percent of people we have told said: ‘Well, it’s about time’. 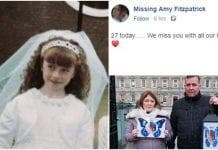 Her daughter Amy has not been seen since January 1 2008 when she was 15 years old. Audrey became engaged to Mahon eight years ago, but Amy’s disappearance from La Cala de Mijas put the plans on hold. Mahon said: “It’s just to have one happy day out of seven years. I notice she is already wearing her wedding ring , did she marry in Spain ? Audrey , audrey audrey ……your marrying the man who killed your son , say it out loud and realise what a complete idiot you are . One happy day out of 7 years he says. He always looked happy enough, tapping his feet, singing to the music, having the craic with the locals and expats in the bars around Calahonda and Cabopino, in fact, he looked like he hadn’t a care in the world………if you ask me, the whole thing stinks. NO sign of any walking stick when he is in Spain, it gets discarded when he lands in Malaga.